Microsoft has released the RC version of Windows Internet Explorer 9 (IE9) recently. In this guide I want to tell you about the new features in Windows Internet Explorer 9 Release Candidate (IE9 RC) version. Microsoft has developed Internet Explorer 9 (IE9) in order to start faster, load web pages faster and enable faster communication while you interact within a web page. To make Internet Explorer 9 perform faster requires the optimization of 11 subsystems in Internet Explorer 9 web browser. Internet Explorer 9 is able to decide dynamically to use GPU based rendering or software based rendering in order to perform faster. IE9 browser includes the performance measurements of different GPU 's to make a better choice between rendering methods. With Internet Explorer 9 Release Candidate version, the default temporary internet files size is increased from 50 MB to 250 MB. This increase is made based on customers using IE. This increase in Internet Explorer 9 default cache size wil enable the IE9 web browser to store more resources locally and serve faster. Also the Internet Explorer 9 Release Candidate introduces a new algorithm to decide which resources will be stored in cache (temporary internet files folder) and which resources will be removed. Microsoft Internet Explorer 9 RC (Release Candidate) is integrated with Windows Power Options settings and obeys the power usage settings that the Windows user has stated in order to minimize power consumed and keep battery life longer. Internet Explorer 9 Menu bar toggle is a new improvement to enable and disable menu bar easier. The Internet Explorer 9 frames are now thinner 5 pixels in each frame, in order to make a wider space for the web site content. A new page context menu option Paste and Navigate is added with Ctrl+Shift+L which enables navigating to a copied web address directly. Web browser users can Go to copied address without pasting the URL to the URL address bar, from directly current page using the Ctrl+Shift+L context menu option. Internet Explorer 9 RC (Release Candidate) enables search for a search term in One Box, the combined box for URL address and search box in web browser IE9. You can refine the search term and modify it easily without retyping it in One Box. Internet Explorer 9 users can make web search using their favorite search engine just by typing the search terms in the URL address bar (One Box) and then by pressing Enter key. Ctrl + E or pressing the One Box search icon on the right side of the URL address bar, the latest search term will be displayed without any change, so the web browser user can easily modify the search keywords. 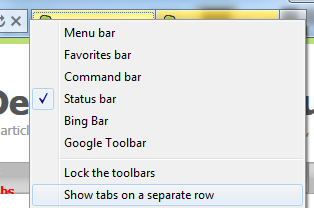 Internet Explorer 9 RC (IE9) introduces a new context menu command "Show tabs on a separate row" which displays opened browser tabs just below the URL address bar. Right-click on the menubar and choose "Show tabs on a separate row" menu item. Opened tabs within the Internet Explorer 9 windows are now displayed under a section below URL address bar. Internet Explorer 9 enables web users to close a tab easily although the IE9 tab is not the active tab in the web browser. When you move your mouse over the tab which you want to close, although it is not active the "Close tab" icon can be selected to close the target browser tab. 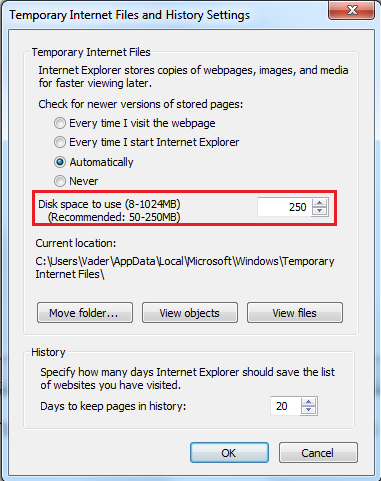 This enables IE users not to lose their focus on the current active browser tab while closing other tabs easily. In the above screenshot, the first tab is the active tab. But by moving the mouse over other tabs, the "Close tab (Ctrl+W)" will be enabled for passive tabs just like Hoover event.